Some very strange data, but it could be pointing to an amazing buying opportunity. I found this really bizarre. 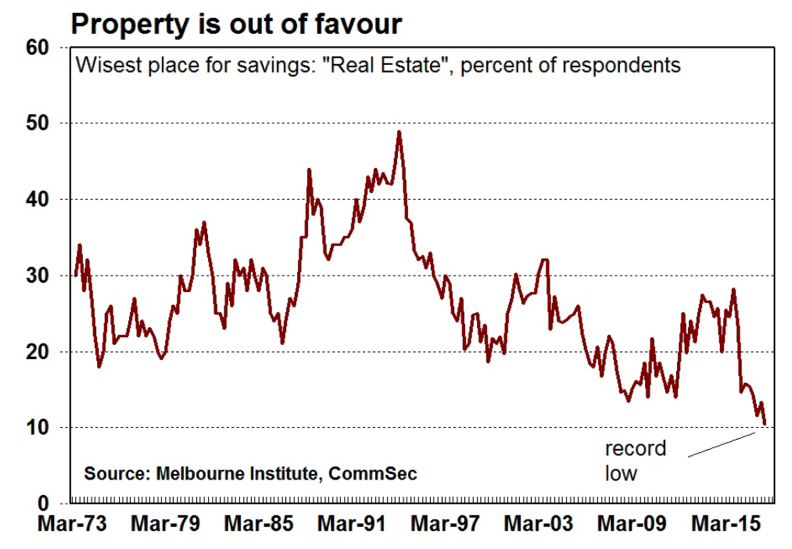 Apparently, confidence in the Australian property market has fallen to an all time low. That’s the word from the latest Westpac Consumer survey. When asked where is the best place to put your money, only 10% nominated property. That’s the lowest level on record. I just find this really bizarre. Why is property suddenly on the nose? I mean look at the recent drop-off. It practically fell off a cliff sometime in 2016. I know the bears have been growling a little louder than normal lately. The doomsayers have been out on the streets in force, sandwich boards round their necks. Four Corners took to things with a hatchet. But scratch beneath any of that and there’s nothing we haven’t heard before. Yes, prices are high relative to incomes. Yes household debt is at an historically high level. Yes some auction results are causing millennials to weep into their lattes. But none of that is new. None of that isn’t anything we haven’t heard before. Some of it’s so old it’s practically “vintage”. Personally, I’m seeing opportunity written all over this. This ‘mood’ isn’t being driven by fundamentals. It isn’t being driven by actual changes in the market. It’s just mood… vibe… sentiment… buzz. So the buzz is a little flat right now. But look at the fundamentals. The major cities are still growing at break neck speeds. 140,000 people into Melbourne last year. They’re pumping out the inner-city “shoeboxes in the sky”, but the detached housing market is plodding along. At the same time, new land sales are actually falling. So supply is rising overall, but where it matters most for most housing segments, it’s actually falling. At the same time, interest rates remain at record lows and aren’t going anywhere fast (up or down). And while household debt is high, it is concentrated with high-income earners – those who can afford it most. At the same time, the economy is starting to show some solid signs of life. Investment and employment intentions are picking up. Unemployment rates seem to be drifting lower. Wages could be doing better but they could also be doing a lot worse. I could go on, but I’ve got things to do and your stop is coming up. The point is, when you look at the fundamentals, maybe they’re not the best they’ve ever been, but they’re pretty good. Maybe ‘great’ even. So if the herd is spooked, I can’t really see much reason for it. And its mismatches like this that are fertile ground for opportunity. As they say, you always want to lean against the movement of the herd. When they zig, you zag. So right now I’m seeing a fearful herd moving into a pretty solid environment for property. If that doesn’t say “buying opportunity” to you, what does? Of course, not everything’s going to be a winner, and there are definitely risks to watch out there. High-rises in Perth and Brisbane have a rough few years ahead of them you’d think. But on the whole, if you’ve done your research and have picked your targets, now could be a great time to push hard on a deal. Get an awesome bargain. Go and get a great deal now before the herd wakes up to themselves. Where do you think the best place for your money is? Can you see where the fear is coming from or do you see opportunity?